Despite a significant body of work, perhaps over 3,400 compositions, the work composer Antonio Caldara remains very much undiscovered territory with only occasional discs rather than a consistent exploration as with the oeuvre of some of his contemporaries. 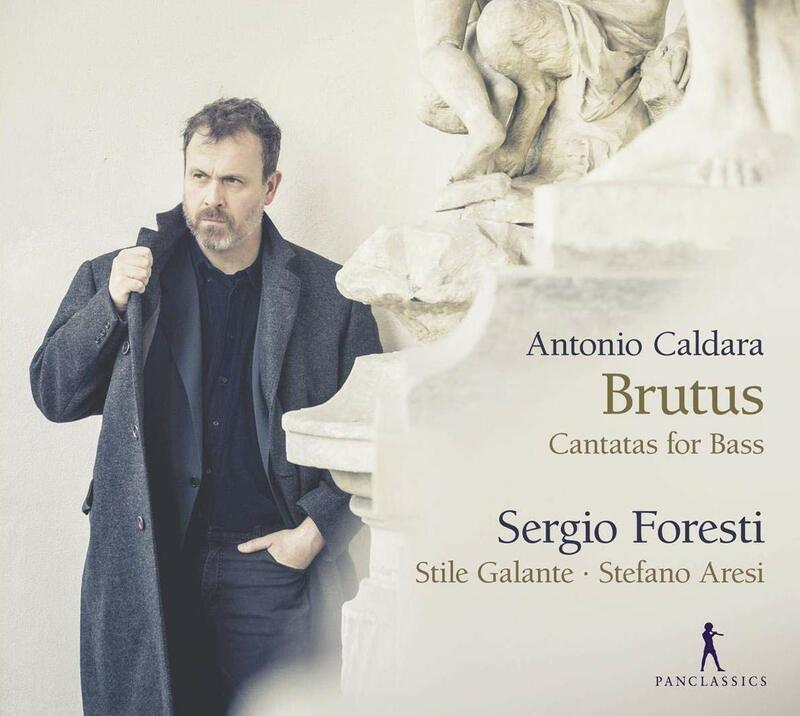 This new disc from Pan Classics presents six of Caldara's cantatas for bass voice and continuo, performed by Sergio Foresti and Stile Galante (Agnieszka Oszanca cello, Gabriele Palomba theorbo, Andrea Friggi harpsichord) directed by Stefano Aresi. The CD booklet article suggests that one reason for the lack of diffusion of Caldara's music in the present day is that his career was almost entirely devoted to working for a series of noble and Imperial families, culminating in his service to the Holy Roman Emperor in Vienna from 1716 to 1736. So that much of Caldara's repertoire was performed once, albeit in grand circumstances, and then the manuscripts disappeared into the archives without the dissemination of copies which helped to make music known during the period. On this disc we hear six cantatas for bass voice and continuo which come from a manuscript created in the 18th century which survives in Bologna and seems to have been created for a particular bass singer, the manuscript also includes music by Antonio and Giovanni Bononcini. One of Caldara's employers, Emperor Charles VI, had a preference for low voices so that Caldara wrote a lot of solo cantatas for this voice and dedicated a volume of 24 cantatas to the Emperor in 1730. In fact, only one of the cantatas on this disc, Il Dario, can be linked to a work written for the Emperor. As Caldara wrote around 350 secular cantatas you cannot help feeling that there is still a lot of work to be done in the archives. These are all continuo cantatas, for voice accompanied by keyboard, cello and theorbo, intimate works designed to be performed in relatively intimate surroundings. Only two of the cantatas fit into the popular Arcadian pastoral genre often used in cantatas, the others identify the bass soloist with a powerful mythological or heroic historic figure, Darius, Polyphemus, Samson and Brutus, who is at a turning point in his career. So we can see a parallel with cantatas by composers such as Handel where the subjects tend to be either pastoral or a protagonist (usually female) under great emotional stress. The result is a series of highly imaginative works, which give the singer opportunities to exhibit a whole variety of emotions. And Caldara's responses to the texts are highly interesting, with Bruto a'Romani being almost a series of political speeches using a lot of arioso elements. And again in Polifemo Caldara uses a lot of arioso in the mix. These cantatas give us the flavour of a very particular composer, and it would be lovely to hear a greater selection of his works. Whilst they are classified as being for the bass voice, some of them sound quite baritonal in quality. Sergio Foresti has quite an interesting and rather grainy textured voice which is highly expressive but which seems not to quite capture the full range of the music. Listening to a whole disc is not quite ideal, but dipping in an sampling a single cantata is a great experience. Foresti is well supported by the players from Stile Galante. This is a very important and very welcome disc. If, perhaps, it is not quite ideal, then it is still a valuable contribution to the (slowly) expanding Caldara repertoire on disc.